Vodafone's Holo Demo Dazzles Crowd, But Is It a Viable 5G Use Case? A small girl wearing a soccer T-shirt climbs on stage. Standing next to her, football tucked under one arm, is Steph Houghton, captain of Manchester City and the England women's national team. Iris, the star-struck child, asks for a display of kick-ups, and Houghton duly obliges. This would be like any heart-warming encounter between a girl and her sports hero, except that Houghton is not really there. She is nearly 200 miles away, at a studio in Manchester. The person Iris can see and talk to is actually a holographic image, beamed onto the stage by Vodafone over a 5G connection. Eleven-year-old sports fan Iris meets the holographic image of England footballer Steph Houghton at Vodafone's offices in Newbury this week. Seasoned hacks and experienced analysts are not easily impressed by technology demonstrations, but Vodafone's display at its Newbury headquarters this week left the crowd dazzled. Analysts who spoke with Light Reading at the event were unanimous in their praise. For any operators showing off 5G's potential in the next few months, Vodafone UK has set a very high bar. The critical thing, said Petty, was to cut the "latency," a millisecond delay that occurs when a signal is sent over a data network. Average latency on Vodafone's current crop of networks is between 50 and 60 milliseconds, which rules out any services based on virtual reality. "You may get motion sickness," said Petty. "The content takes too long to get to the device and there is a lag." Petty thinks latency needs to fall to below 10 milliseconds if virtual reality and related services are to work. "Latency below 10 milliseconds means the lag disappears." With a 5G overhaul, Vodafone reckons it can hit this target. Its RedStream transport network plays an important role here, but virtualization is perhaps even more critical. In old-fashioned networks, hardware and software are inextricably entwined, as in one of Apple's iPhones. With full virtualization, an operator should be able to run network functions as software programs on standard servers. That would make it easier to shift computing power around the network, according to Petty, and even take IT resources out to the network's "edge," in close proximity to end-user devices. "This would shave 30 milliseconds off the 50 milliseconds we are trying to get rid of," said Petty. After launching voice-over-4G and voice-over-WiFi services on virtualized infrastructure, Vodafone more recently began using a virtualized core to support voice calls on the Apple Watch. It is also making "an aggressive move toward cloud-native" systems, said Petty. "That means building more flexible and scalable technologies using our own data centers and the public cloud, where necessary," he told reporters and analysts. But even if Vodafone can speedily overcome the remaining network hurdles, holographic systems will not arrive soon. The equipment customers need to carry out holographic calls is likely to be very expensive, for one thing, and might never make it into the average living room. Petty thinks holographic systems could be a natural evolution of videoconferencing. Ten years ago, that was seen as an expensive gimmick. Today, it is widely used in the office environment. In this context, the question is whether holographic systems can ever make it past the gimmick stage. Some organizations may wonder why executives on a call need to feel they are in the same room together, although others might see holographic systems as a potential way to show off new products, or engage with their customers. Indeed, notwithstanding the costliness of equipment, there is an obvious appeal from a business-to-consumer perspective. "It could allow us to build connections and closer relationships with fans, whether in Manchester, the UK or worldwide," said Houghton when asked how footballers might regard the technology. "This could change the interaction between sports fans and stars," added Petty. "But in a business context, you could also put a doctor in the same room as the patient [at home]." In time, more sophisticated holographic systems might even change the entertainment experience. Imagine watching a ballet where the dancers -- like Houghton at Vodafone's Newbury demonstration -- are performing their magic from hundreds of miles away. A ballet company could potentially reach millions of people who feel the televisual experience does not measure up as an alternative to the live performance. Emma Mohr-McClune, the GlobalData Plc service director for global telecom consumer services, in in broad agreement. "No common-or-garden WiFi could have provisioned the required latency," she said. "It takes staggering amounts of low-latency data to generate a holographic visual. 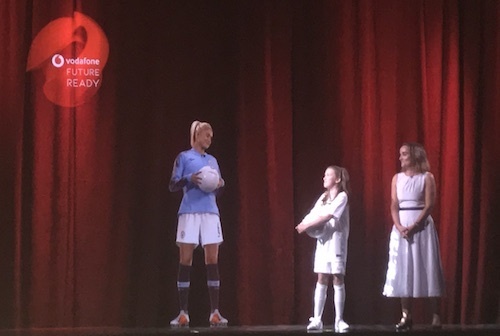 When SK Telecom [a South Korean operator] demoed its WENDY hologram at MWC Barcelona earlier this year, it talked up one gigabyte for every one centimeter of holographic image... Do the math, and you can just imagine what was required to get a full-sized Steph Houghton hologram on stage yesterday." "For sure," said independent analyst Paolo Pescatore, when similarly asked if 5G was really needed to support the holographic display. "For one thing, the media industry is excited about remote production. 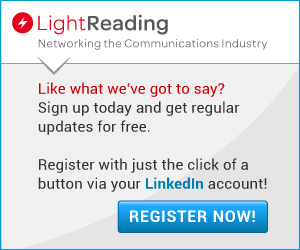 The arrival of 5G will allow teams to operate remotely, providing significant cost benefits." If holographic calls turn out to be a longed-for "killer application," the biggest ask for a company like Vodafone may lie on the business and not the technology side, says Pescatore. "Their demographic is the old," he points out. "The challenge is getting the message out and making it resonate with the young." I appreciate you want low latency for virtual reality but 60ms of latency wouldn't be noticeable for the hologram. Although there are no latency guarantees with WiFi, 802.11n median latency is 6.2ms at 2.4 GHz and 0.9ms at 5GHz according to this study. https://hpbn.co/wifi/ That compares with 4ms for normal 5G and 1ms for URLLC. Maximum data rate for 802.11ac wave2 is 1.73 Gbps according to Intel. 5G is meant to deliver 20Gbps but actual speed will depend on contention ratio which is likely to be higher for 5G than for residential WiFi (where presumably only you and your family are using it). Is 1.73 Gbps enough for the hologram? It depends on the size of the image, frames per second and image quality but my guess from the video is yes. Zoom Video call would have been just as interesting.